The West wind blows in Galway but the scratchcards just keep on turnign. 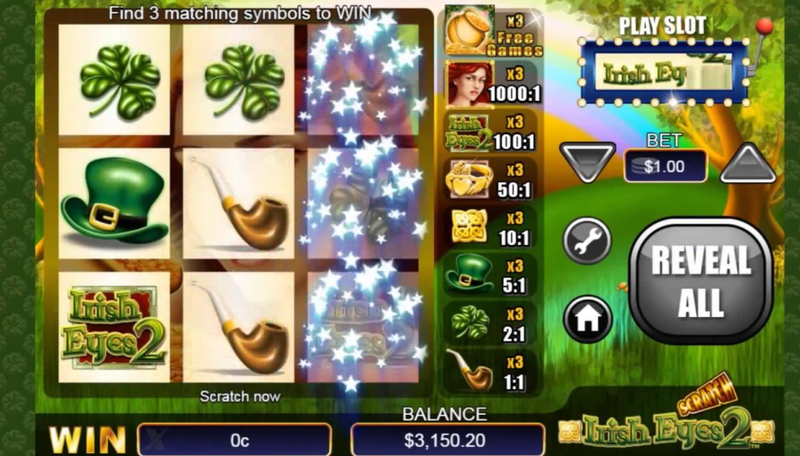 This is your standard Irish slot with a twist, encounter leprechauns and beautiful virtual Irish girls but you must be prepared to risk it all to have the luck O’ the Irish on your side in Irish Eyes 2. NextGen Gaming has brought you another amazing online scratch card. For nearly two decades NextGen Gaming has been a leading developer in online casino gaming, their innovative gaming platforms are filled with captivating themes and stunning graphics, ensuring that you are entertained from start to finish. NextGen are renowned for bring you some of the best slot games currently on the market. You may have heard of some of the following titles; Prosperity Twin, Shangri La, and Golden, all of which are available across the Wizard Slots platform. Irish Eyes is a beautiful maiden with enchanting green eyes and fiery red hair who hails from Ireland. Evoking that typical Irish charm, she invites you to play this online scratch game by finding some of those whimsical symbols which are so symbolic of Irish tradition, folklore and culture. Ireland is renowned as being one of the quirkiest and magical countries in the world, all of which is embraced in this Irish themed scratch card. You’re got symbols such as shamrocks, Leprechaun’s hats, golden shamrocks, and beautiful golden Irish jewellery. Irish Eyes 2 embraces the beautiful lush green countryside of Ireland by using a Leprechaun’s Wood as the backdrop to the game. Don’t be lulled into a sense of peace and tranquillity though, there is a lot to find so you better get going! You can start your bet at 20p up to £200 per game. Finding 3 normal four-leafed shamrocks will win you double your stake, keep an eye out for those Leprechauns as 3 Leprechaun Hats will win you x5 your stake. If you can find 3 Golden Shamrocks you will win 10 times your stake and finding 3 heart-shaped golden rings will bring you an impressive 50x your stake. Once you have found all these trinkets and treasures you’ll then want to find Irish Eyes herself, as her symbols will get you 100x your stake. However, if you want to win everything Ireland has to offer then spend your time searching for three red haired maidens as these will win you 1,000 times your stake. Have you ever dreamt of finding a pot of gold at the end of a rainbow? In Irish Eyes 2 you can! There is a free bonus feature in this online scratch game which is activated as soon as a pot of gold appears on the card. If you match at least 3 Pot of Gold symbols all your cash prizes will be doubled plus 5 more free scratch card games! That means you could have two payouts in a single game. Irish Eyes 2 online scratch card game is a cheerful and interactive game typical of NextGen Gaming and also brings home handsome payouts which you just can’t get from a traditional scratch card. If you love scratch card games Irish Eyes 2 will not disappoint. You can play this game anywhere you can get an online connection, it’s fully compatible with desktop, tablet devices and your mobile ensuring that Irish Eyes will always be smiling for you.